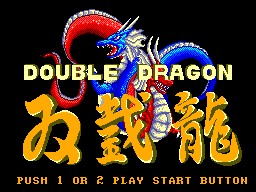 Double Dragon for SMS is a great early side scrolling beat em up that came out in 1988 around the same time the arcade DD was released. It takes a little while to get used to the gameplay in this version but after a short while you will realize that this game is a real gem. 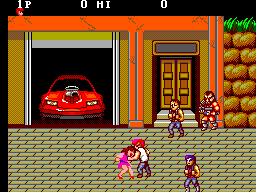 The gameplay on Double Dragon SMS can be incredibly frustrating at times. It takes a while to get used to the controls and the hit detection is a little off (well a lot off but hey). Once the player becomes used to the controls though this game drastically improves as you fight your way through four grueling levels. The best thing about this game is that it is quite close to the arcade whilst retaining a very charming 8-bit feel. This is something I enjoy immensely. 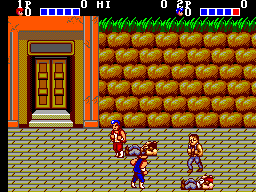 The graphics are probably the best you will find of any of the 8-bit versions of Double Dragon. They characters and backgrounds are all cleverly styled so that the graphics are similar to the arcade original but also have their own unique anime type look. Some of the flicker lets the side down a little bit but overall this is not a huge, huge problem. Another reviewer on the site said that the sound is all bleeps and bloops. While this is true, the music in the game is actually incredible and most of the tunes in the game stay faithful to the arcade original. A great feature of this game. The controls are OK, but the hit detection is very off. If they could have improved upon one thing then this would have been it for me. Once you get used to the attacks and what not though, the game does get a lot easier to play and far more enjoyable.